Is Algex Safe for the Bellows and Seals on My Outdrive? Our Holiday Mansion is wet stored in Florida. I plan to haul her this winter and I know there will be a lot of barnacle growth on the Volvo Outdrives. I want to make cleaning them as easy as possible, naturally!! Would your Algex work?? I’m concerned about the bellows and seals. The simple answer is yes, Algex will work and it’s safe for bellows and seals. How well it meets your expectations however, depends on the extent of the growth. If your boat has been moored, unused and the bottom not attended to for long periods of time, the growth can be very heavy. I have seen boats hauled and the drives were so encrusted with barnacles and algae that they were indistinguishable, looking like huge blobs. Even the propellers were immobilized by the creatures. Cleaning heavy growth like this presents its own set of unique problems. If the growth is lighter you can refer to other posts in the forum for the removal procedure. In answering your question, I will assume that you have heavy growth on your drives. Algex is most effective at removing algae and slime and softening the shells and adhesive rings of barnacles. It is safe to use on metal such as the aluminum drives and props and stainless steel, if your props are stainless. It will not attack rubber or neoprene, which is what I assume your bellows and seals are made of. If the growth is particularity stubborn, you may need to resort to a stronger cleaner like Algae Strip and deal with the cosmetic damage it may cause, after you get the growth off. Algae Strip is safe for cleaning fiberglass and will not damage rubber, but will attack paint, etch aluminum and darken stainless steel. To clean heavy growth, you will need a combination of chemical bottom cleaning and mechanical scraping. I suggest starting with the more aggressive Algae Strip to get the heaviest growth off and then switching to Algex as you get closer to the substrate. For the mechanical part, you will need a hammer, chisels and scrapers. I prefer chisels and scrapers that I make myself from ¾” thick oak planking as they do less damage to the substrate, than metal tools, and can easily be sharpened by cutting back a ¼” or so with a saw or belt sander. To begin with, apply Algae Strip liberally, with a roller or brush. Allow it to work for up to ½ hour and rinse it with a garden hose. This will get rid of the slime and algae and make further work easier. Next chisel and scrape the softened barnacles back as far as you can. Metal scrapers and chisels can be used in the beginning, making sure that you do not strike the drives, props or seals and they can cause damage. Repeat this process until you are within ¼” to ½” of the drive and then switch to Algex and wooden scrapers and chisels to finish the job. With Algex, you can spray it directly from the bottle and let it sit a little longer, making sure that it does not dry out. My concern about the bellows and seals is not that the Algae Strip or Algex will damage them but that the scraping will. If possible use more application of the bottom cleaner and scrub with a brush to loosen and remove the growth. You should also remove the water intake plates to clean out the inlets. Barnacles are known to make there home in these areas as well. Restricted water intakes will cause you motor to overheat. Once the drives are clean, you should assess how much damage has been done, if any. In most cases the paint will be damaged and in some cases the drive casing will be pitted. Pitting will have to be cleaned out, filled in and faired. Although pitting can be caused by aggressive marine growth, the most common culprit is galvanic corrosion. This can be caused by antifouling paint on your boat or from a neighbors as well as electricity, from shore power, leaking into the water, in close proximity to your boat. Galvanic corrosion is stronger in salt water than fresh. If the bellows or seals are brittle or damaged in any way, now is a good time to replace them. If they start leaking when your boat is in the water, the cost will be much higher to repair and damage can result to your boat. If painting is required, try to use OEM products, available from many boat dealerships or marine equipment stores. Most sell outdrive paints in convenient spray cans, in the OEM colors. If you use an aftermarket paint be sure that that it has the same specs and is suitable for constant immersion in salt water. Not all will give your drives the protection that they need. Saving a few dollars at the expense of your drive is not worth it. Keep in mind that aftermarket paints will not give you the same protection as you got from the factory finish so you will have t be more vigilant to insure that there is not damage to your drives. Prior to painting, you should thoroughly sand or scuff the surface and then wash and degrease it to get a good bond. You can use a 1:4 solution of Boat Clean Plus and water to clean and degrease the surface followed by a good rinsing. This is an effective as well as environment and human friendly, water activated cleaner, degreaser used in many service departments. Otherwise, use acetone or toluene. If you’re down to bare aluminum you should use a suitable primer before applying the paint. 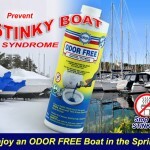 If your boat dealer can’t help you with the products, contact the factory for their recommendations. There a great many options. 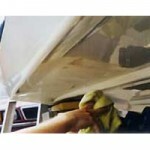 If the paint is in good shape, then a good cleaning with Boat Scrub should be adequate. Before re-launching the boat, apply a protective coating of VS721 Bottom Coat on the drives to reduce future fouling and make clean up much easier. You can use VS721 Bottom Coat on trim tabs, transducers, through hulls, shafts and struts. There is no galvanic action since it does not contain heavy metals. Unfortunately it is not recommended for use on the props. It is a super slippery polymer and will cause the props to slip and cavitate in the water resulting in a loss of speed and possible damage to the prop. If the drives have been re-painted, wait until the paint has sufficiently cured, then prep with Boat Scrub before applying the VS721 Bottom Coat. Also, try to get the VS721 Bottom Coat into the water intakes as well. This will help prevent marine growth from restricting cooling water to the engine.